The OpenSG Users Group Meeting will be held on July 19-22, 2010 at the Westin Book Cadillac Hotel in <?xml:namespace prefix = st1 />Detroit, MI. The meeting will start on the afternoon of Monday, July 19th with an OSG "Boot Camp" - a pre-conference OSG tutorial. We strongly encourage those who are new to the organization to attend the Boot Camp sessions held on Monday afternoon. The sessions on July 19-22 are dedicated to producing work and will not cover historical information. The group rate is available July 18-22 and the hotel will extend the rate two days before and after those dates upon availability. Make reservations by June 27 to receive the group rate! 2. Phone: (313) 442-1600 and reference the OpenSG user group meeting or OpenSG Meeting. 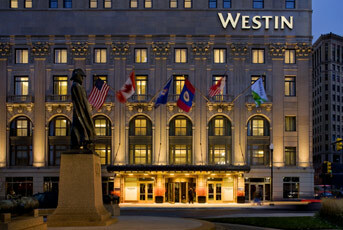 The Westin Book Cadillac Hotel is conveniently located about 20 miles from Detroit Metro-Wayne County Airport (DTW). We will be making regular posts to this site prior to and during the conference. Subscribe to alerts on the conference blog to get important updates as the conference nears. For registration FAQs, meeting room locations, and other details go to the meeting wiki. If you have a question that's not getting answered, put it on the discussion board.